Ok, so a little while ago I bought into the hype and got myself a pair of Amphion One15 monitors to try out, with the Amphion amp and cables. Within a week of having the demo pair, I lucked into finding a lightly used pair locally here in Toronto and figured it was too good to pass up! I’m currently powering them with a Bryston 3B ST. The demo pair was being powered by the Amphion amp100. I’ve been mixing on a pair of Neumann KH120A monitors with a Yamaha HS-10W sub for about a year or so, I had the sub leftover from my Yamaha HS 80 speakers. Let me preface this review by saying: I have worked on MANY different monitors in many professional rooms. 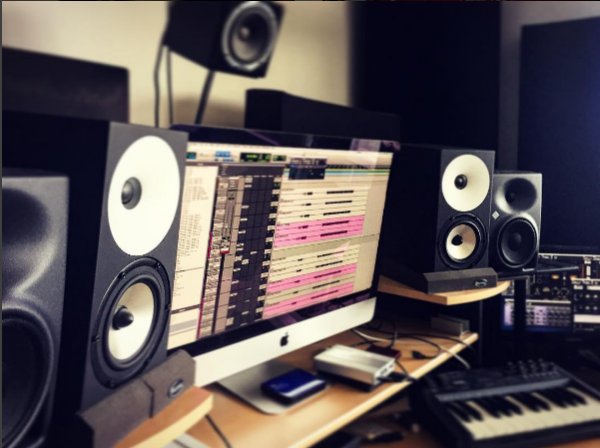 NS-10s, various Genelec and KRK monitors (the old big ones and new small and big ones), Barefoot MM27s and the new smaller ones, focal twin and solo’s, etc etc. I haven’t worked on everything out there, but i’ve logged many hours on a lot of the high end standards in good rooms… just so everyone knows where i’m coming from. In my home studio setup, i’ve spent a good amount of time on the Yamaha HS80s, Neumann KH120’s, and a pair of Focal Solo 6be monitors. I was kind of expecting to be blown away by the Amphion one15 monitors right away. So, I finally get the call, the fed-ex guy is downstairs! I get the boxes home, open them up like a 10 year old on christmas morning, and plug them in as quickly as I could. I hit play on an album i’ve been listening to quite a bit lately. The result?? Not a ton of bottom (they are only the One 15’s after all)… this was expected. Not AS different from the Neumann monitors as I’d imagined they would be. So I start listening a bit more, and after about 10 minutes I started to realize how much better the phantom centre and stereo imaging is on them. The singer is right in front of me. The synths are super wide. Ok, so these are definitely better. I can hear a lot of high end details that weren’t as obvious before. I started over thinking things at this point, so I decided i should just do a mix on them. I’d been told by a few different engineers I really respect that the beauty of these speakers is in how you work WITH them. They’re not designed to be show stopping- play it loud for the band- type of speakers. They’re meant to be used as tools to help achieve great mixes quickly. Ok ok ok… lets give it a shot. So I was a little confused at this point. The speakers didn’t sound THAT much better than the Neumanns. I mean, they definitely sounded better, but I wasn’t that impressed for the price difference after you factor in the amp etc. I had a song to mix that day, so I figured I’d just go for it. I spent a few hours on the mix, just doing what felt natural and trying not to overthink it much. A couple of hours into the mix, I printed a version and went to listen to it on my headphones outside the studio. On first listen with the headphones on, it pretty much sounded how I expected it to. Ok lets go check in the car. Yep, sounds prettty good there too. Maybe i was too wimpy on the bottom end. Spent the rest of the day dialling things in and finishing up the mix. There were a few small tweaks to be made after referencing my avantone mixcube and listening in the car, but nothing too unexpected. First mix for this artist.. I expected a list of mix changes (pretty common for the first song of an album on a new project). A day goes by, I get a call. The artist loves it. There were no mix changes. There were a few arrangement edits to try after hearing the mix so clearly, but that definitely can’t be faulted to the speakers. Ok, that’s a GREAT start. Was it the monitors? Or was it me being hyper aware and thinking more critically because I was mixing on new speakers and excited about them? I can’t really be sure. But since then I’ve had a few more project’s mixed on them. In general I haven’t had any mix comments that are based on EQ, compression, or balance issues. Not that I was getting many complaints before, but for some reason these speakers make me more confident about my choices, and i am finding I am never surprised by anything when I listen on other systems. So the first week I had the speakers, I was using the demo pair I’d borrowed with the Amphion cables and amp100. I decided against buying these, as I found a used pair of the speakers locally by chance, and had heard a few engineers that really liked using them with Bryston amps. I live in Toronto, Canada, and Bryston is a Canadian company who’s amps became a gold standard for many years here. They’re pretty robust and have a 20-year warranty. I found a Bryston 3B ST for a decent price used locally and grabbed it. I have to say, after mixing a few more projects on them with the new amp, at this point I think the Amphion amp sounded better with these speakers. I had mixed for a week with the Amphion amp before switching to the Bryston. One reason I decided to get the Bryston is that I know it will hold its value in resale, and it was easy to find quickly (I had work to get done!). I’m hesitant to buy a brand new Amphion amp because I don’t feel it will be easy to unload in a few years if I get some gear lust and switch monitors again. When companies get this much hype in a short time span, often something new comes along within a few years and their resale value drops. With the amps, it would be even worse. I’m hoping that’s not the case, but that was my reasoning. Overall great monitors, I’d say they’re definitely worth trying out! I prefer them over the focal’s that I’ve used. And right now I can do a mix without referencing ANY other monitors (if i have a sub as well), and I find the mix will translate very well to most other speakers right away. In my semi-treated home studio these speakers have, so far, allowed me to mix quickly and produce mixes that translate the most consistently out of any monitors I’ve tried in the space. They didn’t blow me away on first listen, and still don’t really make my jaw drop when I hit play. But my mixes translate well on other systems, probably more consistently than they have in the past. I was hoping to use these as my sole main monitors in addition to the mixcube, but now I’m thinking about adding a Genelec or some other “crowd pleaser” speaker just for something a bit scooped and brighter to check things on. If the mix isn’t perfect, these speakers will tell you. Great for mixing but not always the most motivational for creating or finishing creative parts of the mix. For me, it would be nice to have something else to switch to for that part. Don’t get me wrong, the speakers sound good! And maybe if I decide to take the plunge on the Amphion amp again, I will change my opinion on needing another set of monitors. Have you tried them? What are your favourite monitors? ?